Introduced at the 1954 Detroit Motor Show, the Ford Thunderbird was marketed as a personal luxury car rather than an out-and-out sportster. Nevertheless with its standard fit 265 cu in (4.3 litre) OHV V8 engine and power assisted steering / brakes, the newcomer stole sales hand over fist from the Chevrolet Corvette. Indeed, such was the impact of the T-bird on the marketplace that GM hurriedly re-engineered the 'Vette. Built around a perimeter frame chassis equipped with independent coil and wishbone front suspension, a 'live' rear axle and hydraulic drum brakes, the stylish two-door Ford sported a glassfibre bolt-on hardtop as standard (though, a convertible roof was a $290 option). Known as the 'Littlebirds' to distinguish them from the 1958 onwards four-seater 'Bigbirds', the '54-'57 T-birds were progressively developed and improved gaining the option of larger V8 powerplants and 12-volt electrics etc. For 1957 the model received a new dropped front bumper and slightly extended tailfins, plus the 312 cu in (5.1-litre) version of the Y-block V8 was standardised, giving some 245bhp and a reputed top speed of more than 120mph as well as 0-60mph in 9.5 seconds. 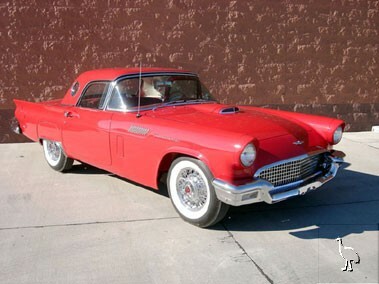 The '57s became the best-selling of the early Thunderbirds, accounting for a record-breaking 21,380 units.